Hilton Head has a wealth of restaurants, so for a visitor it may be difficult to determine which one you want to ride your bicycle to for lunch. So, we have some suggestions that should answer that question no matter what part of the island you are staying on. For the Palmetto Dunes area you have several options. In Shelter Cove there is San Miguel’s, which is located on the south end of the shopping area. The fare is Mexican and you get salsa and chips free. You can sit outside and have a view of the marina. Inside Palmetto Dunes is Big Jim’s located in the club house at the Robert Trent Jones golf course. They have nice big burgers among other things. There is outside seating where you can watch golfers teeing off on the #1 hole. And if you want to ride a bit farther, north of the Palmetto Dunes entrance at the intersection of Rte. 278 and Singleton Beach Road is Harold’s Diner. This is a favorite with locals. For those staying in or near Shipyard Plantation you have lots of options, some being close for the North and South Forest Beach area as well. Inside is the Sonesta Hotel with a pool bar that serves food and a nice outside patio at the hotel where meals are served. Coming out the front gate you can ride south on Rte. 278 and go to Fat Babys Pizza and Subs or Reilley’s Bar and Grille. Both spots have a great lunch menu. Coming out the Pope Avenue gate you can ride to Coligny Plaza and eat at Skillets, The Hot Dog Harbour, or Aqua’s beach side bar and grill. 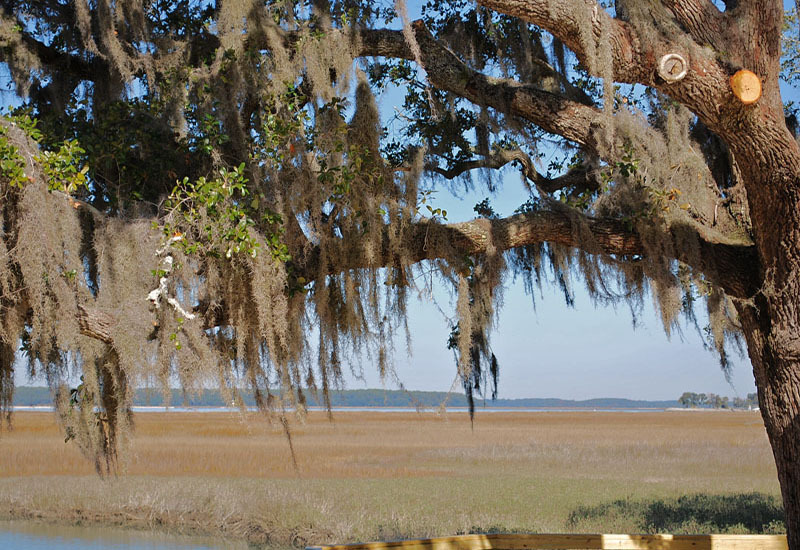 Staying in Sea Pines Plantation you will have many options. Inside the gates is the Salty Dog at South Beach, the Sea Pines Beach House, and two or three restaurants in Harbourtown. And if you are near either the front or ocean gate, refer to the options listed above that are located outside the gates. For everyone on the south end of Hilton Head don’t miss going to Palmetto Bay and eating at the Sunrise Cafe (fantastic breakfast too). It’s a longer ride, but well worth it. If we missed an area where you will be staying, then send us an email and we can come up with more suggestions.